Computer Animation Adventure is one of the latest in the long-runningMind's Eye series of discs designed to highlight the short films of computer animators from all over the globe. Adventure is also releasing along with Computer Animation Experience, and the two are, in essence, one complete project with slight relationships to one another. This disc presents 19 animated shorts of various types; a mixture of older, recognizable classics and newer, films showing some of the mixed technique common today. Although running a relatively short 45 minutes, it's a very enjoyable experience that anyone who appreciates art, computer graphics, and short filmmaking should see. Some of the shorts are literally only a few seconds long, while others are bit more meaty. The two longest films are the super-hero satire Grinning Evil Death and the music video for Todd Rundgren's Change Myself. Amongst the more recognizable of the shorts is Tuber's Two Step, a CG animation classic that aired numerous times during kid's shows and other similar programs. Additionally, the disc contains 3 of the Animals shorts that originally gained cult-popularity as part of the MTV animation showcase, Liquid Television. While I didn't really care for the Todd Rundgren video and the Don't Touch Me music video (mainly because of the music), the disc is still a superb, fast-paced ride through many different kinds of visuals. Particles Dreams showcases some interesting voxel and particle effects, whileFlying Logos is an excellent, humorous portrayal of computer logo design. Embryo is an utterly hypnotic masterpiece of surreal, fractal textures and a stylized Indian music soundtrack. My personal favorite, Continuum is a wonderful animation of what appear to be fragments of stained glass and random artwork moving about to the sounds of a Kronos Quartet/Philip Glass musical score. Another interesting piece is Mars The Movie, a short look at a detailed rendering of the Martian surface as created by Jet Propulsion Labs, set to the music of Gustav Holt's Mars, Bringer Of War. While the combination of material here is not all short films, some of it is just randomdemos and logos, it's still worth watching. It's also a nice archive of older shorts, a few of which were obviously revolutionary when originally released (like Tuber's Two Step) and helped push the limits of computer imagery. It isn't quite as immersive as the actual Mind's Eye movies, but it's still a fun disc to play when you're not quite in the mood for any particular thing, so you get a whole lot of different things thrown at you. Image Transfer Review: While the shorts are of varying source quality, all them look as solid as possible in anextremely clean and smooth transfer with no compression artifacts or exaggeratedproblems. A few of the shorts exhibit some grain and have varying black level, but none of them are flawed in any way that takes away from the experience. Color is clean and the reproduction of fast motion is brought out with precise quality. No complaints here, really. Audio Transfer Review: As you might expect, audio quality differs from short to short, but overall, the audio isquite good. There seems to be an equal division between shorts in mono and shorts in stereo, and both sound as vibrant and energetic as possible. It depends mostly on the source material, none of which is ever damaged or problematic in any of the films. It isn't an expansive home theater experience, but it is fitting. Extras Review: There are no additional features on the disc other than chapter stop menus (withfull-motion images). 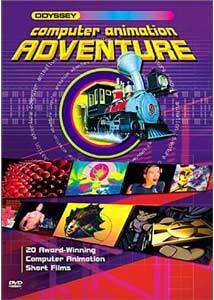 Computer Animation Adventure fits in nicely with the rest of the Odyssey/Mind's Eye series and is a worthy rental or purchase for any fan of the genre.